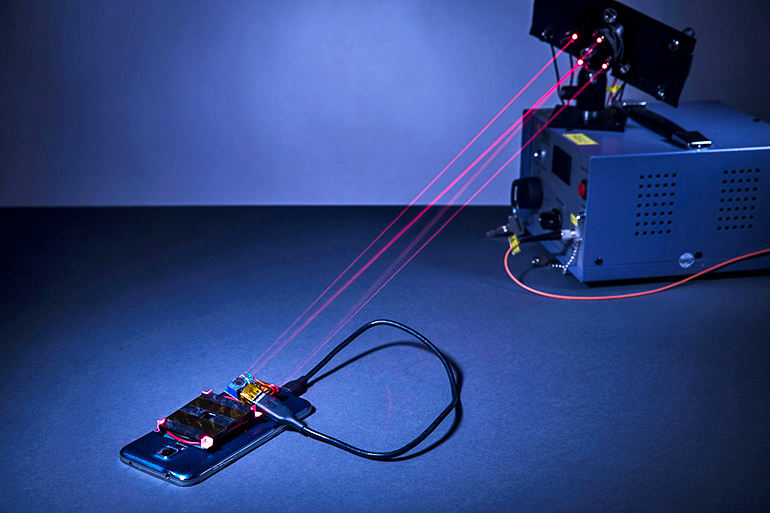 Engineers have, for the first time, come up with a way to safely charge a smartphone wirelessly using a laser. A narrow, invisible beam from a laser emitter can deliver charge to a smartphone sitting across a room—and potentially charge the phone’s battery as quickly as a standard USB cable. 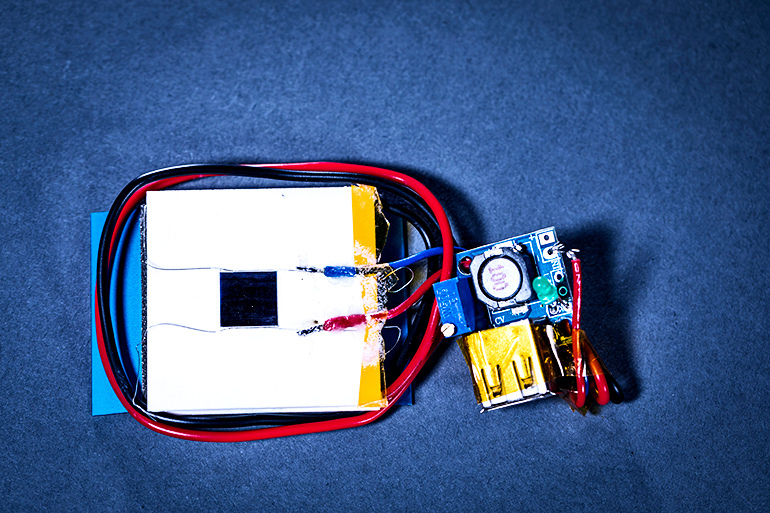 To accomplish this, the researchers mounted a thin power cell to the back of a smartphone, which charges the smartphone using power from the laser. The team also custom-designed safety features—including a metal, flat-plate heatsink on the smartphone to dissipate excess heat from the laser, and a reflector-based mechanism to shut the laser off if someone tries to move in the charging beam’s path. “Safety was our focus in designing this system,” says coauthor Shyam Gollakota, an associate professor in of computer science & engineering at the University of Washington. “We have designed, constructed, and tested this laser-based charging system with a rapid-response safety mechanism, which ensures that the laser emitter will terminate the charging beam before a person comes into the path of the laser,” Gollakota says. “In addition to the safety mechanism that quickly terminates the charging beam, our platform includes a heatsink to dissipate excess heat generated by the charging beam,” says Arka Majumdar, assistant professor of physics and electrical engineering, who is also a researcher in the Molecular Engineering & Sciences Institute. The charging beam is generated by a laser emitter configured to produce a focused beam in the near-infrared spectrum. The safety system that shuts off the charging beam centers on low-power, harmless laser “guard beams,” which are emitted by another laser source co-located with the charging laser-beam and physically “surround” the charging beam. 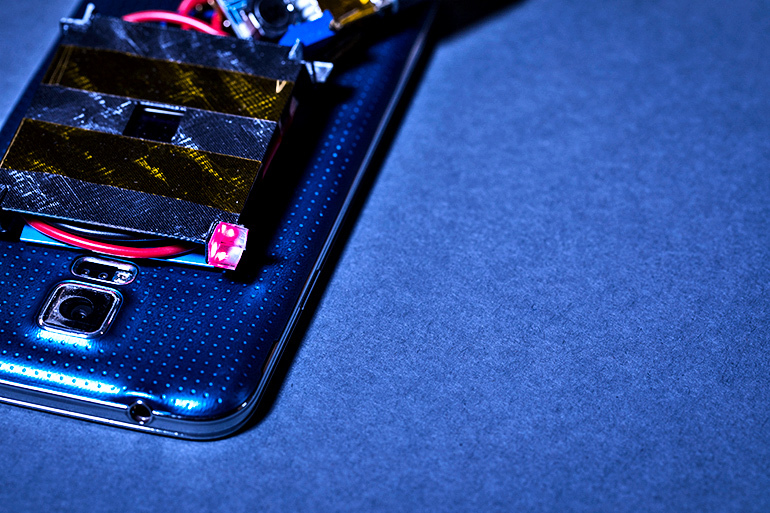 Custom 3D printed “retroreflectors” placed around the power cell on the smartphone reflect the guard beams back to photodiodes on the laser emitter. The guard beams deliver no charge to the phone themselves, but their reflection from the smartphone back to the emitter allows them to serve as a “sensor” for when a person will move in the path of the guard beam. The laser emitter is designed to terminate the charging beam when any object—such as part of a person’s body—comes into contact with one of the guard beams. The blocking of the guard beams can be sensed quickly enough to detect the fastest motions of the human body, based on decades of physiological studies. The next generation of nano-scale optical devices are expected to operate with Gigahertz frequency, which could reduce the shutter’s response time to nanoseconds, Majumdar adds. “This acoustic localization system ensures that the emitter can detect when a user has set the smartphone on the charging surface, which can be an ordinary location like a table across the room,” says co-lead author Vikram Iyer, an electrical engineering doctoral student. To ensure that the charging beam does not overheat the smartphone, the team also placed thin aluminum strips on the back of the smartphone around the power cell. These strips act as a heatsink, dissipating excess heat from the charging beam and allowing the laser to charge the smartphone for hours. They even harvested a small amount of this heat to help charge the smartphone—by mounting a nearly-flat thermoelectric generator above the heatsink strips.